Curse Of The Lady's Light is part 2 of 6 of the Shattered Star Adventure Path; that book is necessary to run the adventure but Pathfinder Fate Accelerated write ups are provided for the various opponents and challenges faced therein. Use the linked to documents as relevant to the published adventure. Part 1: The Journey South: a journey south of the magnificent metropolis of Magnimar into the dangers of the Mushfends. Part 2: The Lady's Cape: boggards, troglodytes, and swamp witches must be dealt with to discover a way into the massive Lady's Light monunment. Part 3: The Lady's Light: into the chambers beneath the monolith...and great danger. This part of the adventure is extremely sandboxed and there is no clock on it. There are also several 'wildcard' elements that can either make things harder or easier for the adventurers depending upon their actions and roleplaying. 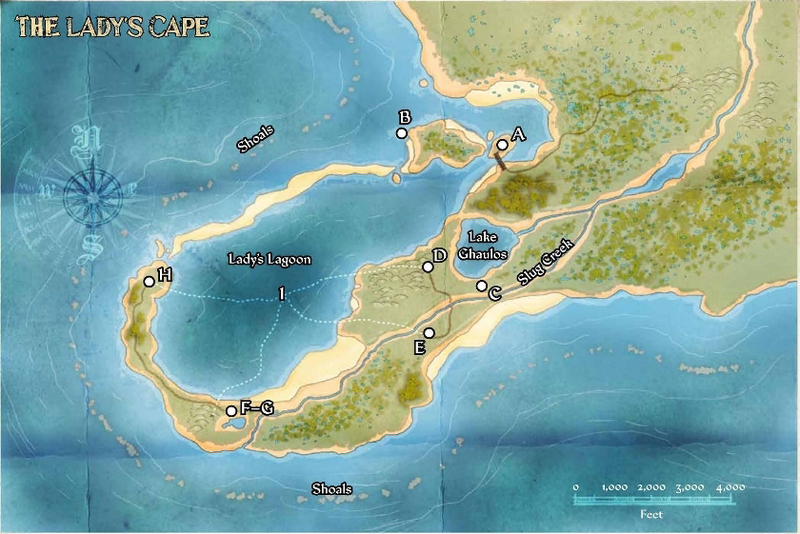 The adventurers are free to wander around exploring the Lady's Cape region encountering both habitat-appropriate encounters as well as the scripted opposition of warring tribes of boggards and troglodytes. 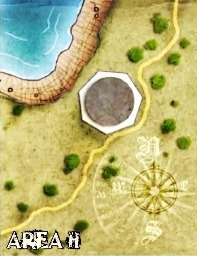 There's no real penalty for adventurers that just want to muscle through it, heading straight for the Lady's Light monument and finding a way in via the most expedient means. However a good deal of outdoor adventure fun can be had prior to getting on with finding the Shard. Groups with one or more Primal oriented characters might find it more engaging than a group that skews more towards urban and delving skills. 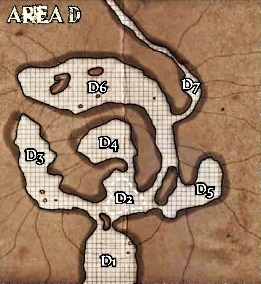 Due to the sandboxed nature of this section, there is no guarantee as to what order the adventurers will bump into encounters and thus the below write-ups should be consulted as needed rather than taken as a linear progression. 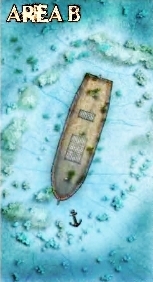 If the adventurers arrive by ship they will likely encounter the swamp witch Maroux soon after landing as her hut is near where they would be put ashore. If the adventurers sought out Jasper in Part 1 and got useful information out of him, he would have told them about Maroux and thus they might seek her out based upon Jasper's recommendation. If they arrive by land and did not get info from Jasper, then Maroux may or may not be encountered in any particular order based upon events in play. If it does occur, the encounter with Maroux is pivotal. Should the adventurers make her actively hostile, though she is not powerful enough to prevail against a group she can inflict some harm before fleeing or conceding and can become a dangerous wild card. On the other hand, if the adventurers play their cards right Maroux can be a very helpful ally or at least a neutral party offering useful services such as potions for sale. a shockingly intelligent but deeply introverted half-orc, Maroux simply wants to be left alone to enjoy nature and her studies. She is literally a harmless hermit, a naturalist of sorts, content to live her simple life without the interference or annoyances of others. She finds the stereotype of a frightening swamp witch a convenient deterrent towards that end and tries to scare off trespassers and interlopers. However, she can be reasoned with and can be a tremendous aid to adventurers who get on her good side. Aside from offering a relatively safe place to rest, she can heal, make potions, and has deep knowledge of the Mushfens area. A Cheliax merchant vessel that mistook the Lady's Light for the Port of Magnimar and ran aground. The crew were slaughtered by boggards, but rose again as undead led by their once-captain, Linus Halfclasper. Good At: During the day and from the shore it is a Fair (+2) challenge to notice the wreck of the impdrake beneath the water. Each stress box represents a separate skeleton. The mob gains +1 to attack for every two (2) stress boxes that remain unchecked. +1 attack for every three (3) skeletons remaining in the mob. Captain Linus and his skeletal crew do not pursue opponents further than a hundred feet from their sunken ship. Sword of Captain Linus (-2): Because I have a magical weapon, I gain +1 when Combative to attack and defend while wielding it. 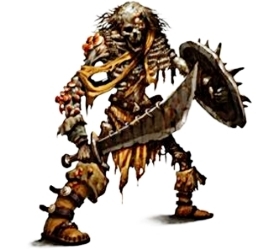 No Flesh To Harm (-3): Because I have no soft tissue, I gain +4 to defend against attacks that cut, stab, poison, burn, or otherwise deal damage by harming flesh. This is a discovery encounter. 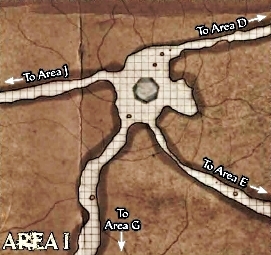 If the adventurers have not already been informed about the trogs and boggards in the area, they can identify the corpses of the slain at this location. The difficulty for a Clever character is Fair (+2); using Primal reduces the difficulty by -1. However, there's much more significant pieces of information to be noticed here. First, a broken dagger of one of the Grey Maidens can be found amongst the debris by a determined search...coated in a poison that infects those stabbed with filth fever. The second is a holy symbol of the foul demon lord of caverns, reptiles, and troglodytes...Zevgavizeb. These caves are the home of the area's troglodyte tribe. Normally the tribe was large enough to be more than a casual threat, but the trogs have had a tough time of it lately. Their great rivals, the boggard tribe also active in this area, have been unusually agressive recently and have exercised much more advanced tactics learned from Grey Maiden 'advisors'. Further, the boggards have been poisoning their weapons with filth fever and injured troglodytes have been sickening and dying in great numbers from this disease. Only a fraction of the tribe and Uggilo, the priest of their foul demon god, remain. 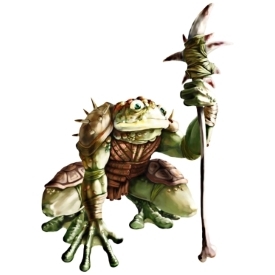 If the adventurers kill off Uggilo and cure the more than a dozen diseased trogs in area D5, they will basically win over the remainder of the tribe and gain a potentially useful new ally. 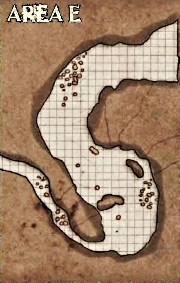 With some redeeming the trogs can even become part of the mercantile trade sub quest of Sabriyya Kalmeralm it that angle has been included in a given GM's campaign. In areas that note that troglodytes are present, unless otherwise indicated refer to the below write-up and set the Stress to equal the number of troglodytes in the area. Bad At: Above Ground (-1), Easily impressed and frightened by bright Flashy magics. Up to ten (10) troglodytes will form a mob. Add one (1) hit box per troglodyte. +1 while attacking and overcoming for every three (3) troglodytes remaining. Three troglodytes are on guard at the entrance of the cave, and they have a barricade and a stockpile of alchemist's fire. If intruders approach threateningly, the trogs will use one of the alchemist's fire bombs to ignite the barricade (just assume it works unless the adventurers are actively doing something to prevent it), and lob the remainder at the intruders that get too close. Benefit: +3 while Quickly Focused to attack a target that I can detect and have a line of sight to within two (2) zones with a grenade like item that bursts into flame on contact. If I succeed with style, I must reduce the stress to get a boost but the boost is upgraded to the situational Aspect On Fire with two (2) invokes, which is attached to the target. This Aspect is automatically invoked at the beginning of subsequent exchanges to inflict two (2) stress to the target per invoke. It is a Fair (+2) difficulty to remove this Aspect. The user must be able to throw the alchemist's fire at the target. This is a situational Aspect that is automatically invoked each exchange to fuel a raging fire along the length of the barricade. Anyone entering the flaming area takes four (4) shifts of stress related to fire damage and smoke inhalation. When there are no more invokes remaining the fire has run out of fuel and burns out; however the area remains uncomfortably hot and embers continue to burn down for five to ten minutes afterwards. There is a pit trap here. It is easy for a careful outdoorsman to spot, but less so for city slickers and farm boys. The trap doesn't require disarming; throwing something heavy enough on top of the trap will 'trigger' it. Just skirting the edges of the cave around the trap is sufficient. The sharpened spikes of the pit are poisoned with spider venom. Bad At: Difficulty to detect is reduced by (-2) while being Primal, Difficulty to detect is reduced by (-1) while being Careful. Good At: Poking Holes In People That Fall In To Me (+3), If I inflict a consequence it has something to do with being poisoned by spider venom. Four troglodytes are in this area burning the corpse of a fifth trog who succumbed to filth fever. Chanting and praying, they are distracted. Fourteen troglodytes huddle miserably in this area, all deep in the stages of filth fever and near death. They are too helpless to defend themselves. There is a high degree of contagion in this room; it passively attacks people in the room with open wounds. When a character with open wounds (as indicated by consequences or situational Aspects) is in this area, attack them each exchange using Infection. Any mild consequence taken from this attack are called Exposed To Filth Fever; any moderate consequence is called Infected With Filth Fever; and any severe consequence is called Ravaged By Filth Fever. Four troglodytes are in this room arguing in Draconic about whether they should desert the cheif Ugglio and leave for safer pastures, or stay. They are distracted by their discourse. If the adventurers attack, the last trog standing is an apostate from the tribes cult known as Sulgesh. He'll surrender, beg for his life, and spill the exposition about the recent escalation in violence in the fued between the boggards and the troglodytes. Uggilo, the tribes priest of Zevgavizeb and sole remaining leader, is in this area. He is attended by two fanatical troglodytes who believe that their servitude to the cleric will earn them special roles in the afterlife. They maintain posts near the entrance to this cavern, hidden against the walls. If they notice any intruders they shriek a warning and step out to attack the adventurers before the intruders can fully enter the room, giving Uggilo time to prepare to meet this new threat. Uggilo also has a pet caveigator. the last remaining authority figure among the troglodyte tribe of Lady's Light, Uggilo dwells in a cave used as a shrine to Zevgavizeb. Uggilo has spent his recent days praying fervently for Zevgavizeb's intervention against the boggards, periodically offering up a sick troglodyte as a sacrifice. Uggilo is greatly feared by the other troglodytes, who believe him to be the immortal son of their demonic god...for how else could Uggilo have outlived the other champions of the tribe and even the chieftain? Uggilo's closest companion is an enormous caveigator he raised from a hatchling. The caveigator is nameless but loyal, and is never far from Uggilo's side. This area contains violet fungi, one of the more macabre low level dungeon denizens. A man-sized ambulatory mushroom with tentacles that instantaneously whither flesh to the bone. These things are not to be messed around with. Fortunately they are easy to take out from a distance, and those wearing a lot of metal armor or something similarly inorganic are less imperiled by those wearing leather or cloth. Up to five (5) Violet Fungi will form a mob. Add three (3) hit boxes and +1 to attack with Necrotic Touch for each additional Violet Fungus. 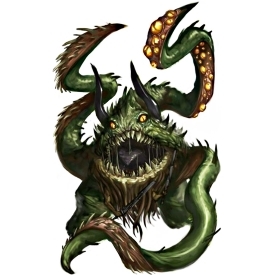 Plant Traits: Because of my verdant nature, I am immune to mind-affecting effects (charms, compulsions, morale effects, patterns, and phantasms), paralysis, poison, polymorph, sleep, and stun. However I take +1 shift of stress from attacks that rely on cold, fire, acid, or are described as being especially effective vs plant life. Necrotic Touch (-4): Because my tentacles have the ability to instantly whither and rot a living creature's flesh to the bone with a mere touch, I gain +8 to attack a target in my zone and consequences inflicted by me tend to involve massive permanent scarring, whithered limbs, and similar major physical maiming. Slow Movement (+3): Because I am only able to travel very slowly, it takes me three exchanges to move one zone and I may not move and attack in the same exchange. A violet fungus feeds on the rot and decay of organic matter, but unlike most fungi, they are not passive consumers of corruption. 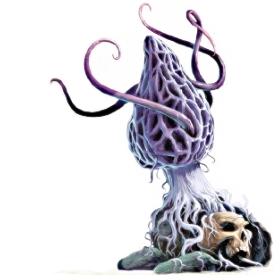 A violet fungi's tendrils can strike with unexpected swiftness, and are coated with a virulent venom that causes flesh to rot and decay with nauseating speed. This potent poison, if left untreated, can cause the flesh of an entire arm or leg to drop away in no time at all, leaving behind only warm bones that soon rot into corruption as well. The violet fungus is one of the most notorious and feared dangers of the world's caves. A traveler can often see signs of the violet fungus in those who dwell or hunt in places where these carnivorous fungi lurk. In these folk, deep and hideous scars mar bodies where entire furrows of flesh seem scooped away—the marks of a close encounter with a violet fungus. Although violet fungi are mobile, they only move to attack or to hunt for prey. A violet fungus that has a steady supply of rot to sup upon is generally content to remain in one place. Many underground-dwelling cultures take advantage of this penchant, particularly troglodytes and vegepygmies, and keep multiple violet fungi in key junctions and entrances to their caverns as guardians, making sure to keep them well fed with carrion to prevent them wandering farther into the den in search of food. A dangerous pyrohydra lurks here and it is a menace. This can be an extremely deadly encounter for the adventurers. 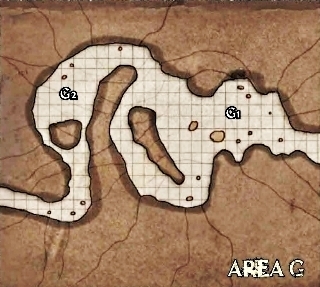 The GM should be sure to read the source material carefully to understand the nature of the encounter, the layout of the caves, and so forth. If a suitably epic encounter occurs and the pyrohydra is dealt with permanently and stylishly, such an outcome would likely feel like a 'big success' to the players, and the GM might consider awarding an extra significant milestone to cement it. legendary serpents of vicious hunger and amazing regenerative powers, renowned for their ability to sprout two new heads when one is decapitated. Resembling a collection of snapping serpents atop a thick, coiling lower body that can run up to twenty feet long, a Pyrohydra is an imposing and dangerous menace, lairing in the arid and volcanic areas of the world and devouring any creature smaller than itself. The boggard village is currently in a subdued state due to a political coup that has seen the Chieftan on the outs. Long story short, the boggards were cooperating with the Grey Maidens, but the Maidens have been out of touch and also Chief Daghop was not a big fan of the Maidens. Things very recently came to a head and the Chief lost. Consult the Lady's Light book for all the details. The adventurers theoretically might be able to reach an accord with Mama Beballa, but she's pretty invested in the Grey Maiden alliance at this point. 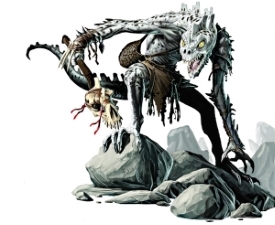 If the adventurers do not encounter the village, they will later encounter Mama Beballa, the bogwid, and eight boggards underneath the Lady's Light as Mama attempts to reconnect with the Grey Maidens after having successfully killed off Daghop and taking full control of the tribe. In areas that note that boggards are present, unless otherwise indicated refer to the below write-up and set the Stress to equal the number of boggards in the area. Up to ten (10) boggards will form a mob. Add one (1) hit box per boggard. +1 while attacking and defending for every three (3) boggards remaining. There are numerous inhabited huts around the village, containing between one and three boggards. Roll a single Fate die; on a + there is one boggard, on a blank there are two, and on a - there are three. There is no encounter here, unless the adventurers alert the boggards to their presense. A bogwid is a strange creature looking like part octopus and part frog. The boggards have domesticated one and keep it as a sort of mascot. It will attack non-boggards that get close enough to it. This nightmare shambles along the ground on eight muscular tentacles that leave behind a clear viscous residue stinking of putrefaction. Its amphibian skin is moist, green-black, and covered in warts and protuberances. On its back, dozens of fist-sized pustules shift and pulsate with nauseating vitality, like sentient oily bubbles threatening to burst. Resistances: Because I am a freakish aberration, I reduce stress inflicted on me by fire and acid damage by two (2). Revolting Aura: Because I am a both visually and odoriferously revolting aberration, I gain +4 to create advantage as a free action against all other non-aberrations in my zone at the beginning of each exchange, and on those entering my zone, and on those whose zone I enter to add the situational Aspect Sickened to each affected target. Targets can defend against this while Focused or if they have Combative +3 or higher they may use Combative instead. A given target can only be targeted by this ability once per conflict. Hurl Offspring: Because I grow disgusting symbiotic offspring on my back, I gain +4 to attack a target in my zone or an adjacent zone by throwing one of my offspring at them. If successful instead of doing damage immediately I attach one of my offspring to the target, and my offspring will start attacking the target on its own. See Bogwid Spawn profile for details. Attached Damage: Because I latch on to my victim and am hard to get rid of, when I am latched on and someone attacks me while not being Careful, half of the damage inflicted on me is inflicted on my victim as well. Chief Daghop's three boggard 'wives' remain here, guarding his stuff. They are hostile to the other boggards in the camp due to the current political coup, and can be reasoned with if the adventurers do not enter the hut. Otherwise they fight to the death. They carry daggers poisoned with filt fever as well as morning stars or clubs. 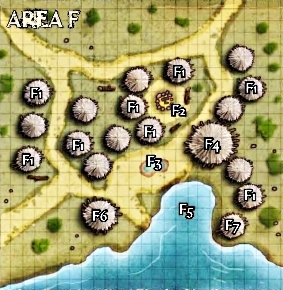 If the adventurers loot the hut, they might find almost a thousand gold in mixed coins and six chrysoberyls worth around a hundred gold each. Four bogwiggles live in this pond guarding the boggards spawning pool. the brood mother of the Lady's Light region's dominant boggard tribe. She recently seized control of the tribe by arguing for continued alliance with the Grey Maidens, against chief Daghop's strongly felt opinion that the alliance has served its purpose and should be set aside. Her current problem is that the Maidens have not been in contact recently. A single troglodyte prisoner is bound hand and foot amongst the cultivated midden the boggards are using to infect their weapons with filth fever. The troglodyte is nearly dead from filth fever but holding on. If the adventurers heal and release her, it goes a long way towards turning the trog tribe into allies. NOTE: These caves connect (eventually) with the entrance chamber to the Lady's Light, and presents one of the easier ways to get in. This area is a shrine to the boggard's goddess, Gogunta. The disgruntled chief has retreated to here after suffering a political defeat. Four boggards loyal to Daghop play at dice in this area. They attack at the first sign of intrusion. The deposed cheiftan, Daghop, sulks within this cave. However, if he hears his minions in G1 come under attack or sound an alarm, Daghop will charge in and unhesitatingly attack. an overthrown cheiftan. Nursing his wounded pride, he sulks in the tribe's 'holy caves', plotting to retake his tribe but too afraid of Mama Beballa to actually act. A treacherous Will o' Wisp lurks in this area. tiny, invisibile-at-will, flying, glowing things that lure sailors and fools to their doom. Feeding on pain and suffering, will o' wisps like to loiter around dangerous areas and enjoy the schadenfreude as victims are subjected to unpleasantness. If naturally occuring accidents are not sufficient, will o' wisps will proactively lure victims into harms way; the classic scenario being to trick sailors into running aground or luring the gullible into swamps. An astounding number of strange albino insectoid creatures, each the size of a man's finger, scuttle and scurry along the walls. But while the finger-sized creatures that swarm the cave are harmless solifugids, the three man-sized albino cave solifugids who lurk here pose a more serious threat; they scuttle along the walls to try to attack intruders by surprise. 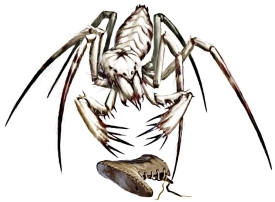 Solifugids are spiderlike arachnids with oversized claws and frightening vertically aligned maws. Ambusher: Because I am so good at ambushing my prey, if I am able to surprise an opponent I gain +4 to attack in the first exchange. Four caryatid columns, a kind of guardian construct, protect this chamber. With its feet planted firmly together, this marble statue of a female warrior holding a stone sword rises up to support the ceiling. Each caryatid column is programmed to guard an object or area when created, and once set this command cannot be changed. Caryatid columns are often given specific parameters concerning whom to ignore and whom to attack when installed. A caryatid will guard the area it is programmed to ward with mindless ruthlessness, but will not pursue fleeing targets outside of the area. If all interlopers flee the area a caryatid will wait a few minutes on guard, and then return to its pedastal to resume its statue-like pose. Caryatids can be encountered singly, but it is far more common for several (or even many!) to be installed together masquerading as load-bearing or ornamental columns; caryatids deployed in this way are usually programmed to wait until targets are within range of two or more of them and attack simultaneously to maximize the surprise factor. Caryatid's are tough opponents and there are four of them, so this should be a pretty solid encounter for the adventurers. From here the adventure transitions into Part 3, The Lady's Light.